Savory Plant Based Dishes — Dine on In! I spent the weekend eating too much. Has that ever happened to you? I caught a cold that lasted longer than two weeks recently and because my taste buds were shot, I was eating sugary, salty, delicious (I think, I couldn't smell) food. While I was indulging (whoever said "no one eats when home with a cold", hasn't met me- I ate everything just so I could taste something). When I was finally feeling better, I decided to cook something plant based as a way to get rid of all the fatty and salty stuff I've been consuming the past week while home with a cold. I think I have mentioned that I'm inspired by cultural cuisines and I wanted something Indian inspired. Turmeric and Curry Powder always remind me of Indian Food. I love the vibrancy of these spices. I'm always attracted to cooking with spices that have so much color and turmeric has the best color! I use turmeric at night to help me sleep and relax. It has anti-inflammatory properties that help me. I'm always on my feet during the day so at night, I want to just relax. So I sprinkle a teaspoon into my dandelion tea. 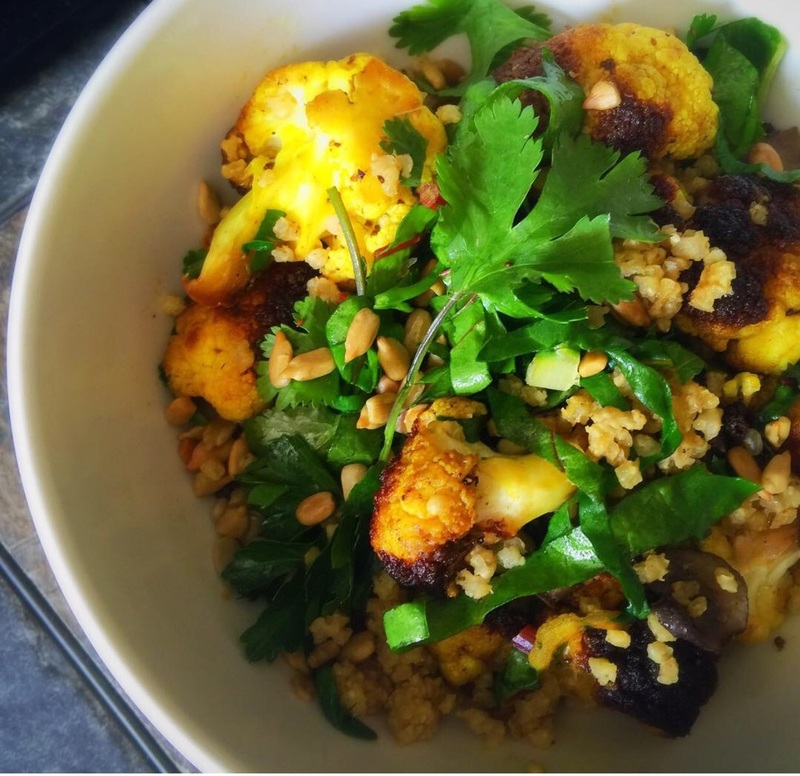 Turmeric Spiced Caulflower with Millet and Mushrooms. Topped with Sunglower Seeds, Rainbow Chard and Cilantro. What a colorful dish right? It's the combination of turmeric and curry powder. 1. Heat cast iron pan (this helps to char the cauliflower and also cooks it evenly) to medium heat. In a bowl, season Cauliflower florets with the spices. 2. Add one tsp of oil and add the cauliflower and cook until most of it is charred and softened. Set aside into a bowl. 3. Fill a bowl with the millet mixture, then add cauliflower and top with sunflower seeds and freshly chiffonade chard and top with a cilantro sprig.